“We were at the edge of the cliff,” admits Skeletonwitch guitarist Scott Hedrick, chatting to Hammer on a rare day off in Hanover, amid a frantic schedule of Euro festival appearances. His band have just gone through one of the most turbulent times of their career, firing their original frontman Chance Garnette in late 2014 under controversial circumstances. To answer this question, they would have to look away from the yawning abyss and towards the path that had taken them there in the first place. Formed by Scott and Nate in 2003, Skeletonwitch began as a way for the kindred spirits to express their creative vision while studying at Ohio University. With Nate’s brother Chance on vocals, the trio would form the core of Skeletonwitch for more than a decade, growing from an act that booked shows and mini-tours during school holidays into a well-respected institution of the American extreme metal scene. Drawing their sound from across the expansive extreme metal canon, the band could just as easily tour with death metal bands as with thrash, their sound owing fealty to both camps while never squarely fitting in with either. That didn’t stop them from being lumped in with the mid-00s thrash revival movement, though (“That was totally just a proximity thing,” Scott says). With this approach, Skeletonwitch were able to escape the inevitable creative stagnation that would catch up with many subgenre adherents. But, while they remained a vital force, tensions were bubbling under the surface. In October 2014, during a tour with Amon Amarth, Chance stopped appearing onstage with Skeletonwitch to address what the band called “serious personal matters”, and the remaining members played as an instrumental four-piece. At the same time, reports arose that he had been arrested ‘on charges of assault and battery on a family/household member’, an incident that proved to be the final straw for Skeletonwitch. But while they had decided to fire Chance, they didn’t make an official announcement, leading many fans to believe his absence was temporary. In early 2015, the band hit the road for a European tour and drafted in Cannabis Corpse/Battlemaster vocalist Andy Horn. The message was clear: Chance Garnette was no longer part of the fold. Chance responded with a public statement to the site Metal Injection, citing “a drinking problem” as the reason for dismissal. The topic of Chance is unavoidable, and Scott deals with questions with the tactful grace that any sensible person would when forced to discuss an ex-bandmate. That said, some details do become apparent as we chat – that Chance’s dismissal wasn’t the result of a single event, but rather a number of things (the phrase “negative energy” comes up often), that even though Nate and Chance still have a familial relationship, Scott hasn’t spoken to him since (“I sent an email asking if he wanted to grab coffee – he didn’t respond”), and that the relationship had soured long before the eventual departure. Ultimately, though, Scott sees it as something the band had to go through to get to a better place. As their European tour ended, it quickly became apparent that Andy didn’t have the time to join the band on a permanent basis, leaving the looming question of whether Skeletonwitch could continue with a new vocalist. 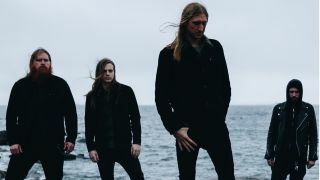 Yet the bond that had been forged between Scott, Nate and long-time bassist Evan Linger won out, the trio having been through enough to know there was something special in Skeletonwitch’s eclectic mix of styles and sub-genres. From there, it was a question of finding somebody they could gel with. They turned to Wolvhammer and ex-Veil Of Maya vocalist Adam Clemans, who they admired and had toured with. Now 15 years into their career, Skeletonwitch are a more refined unit. The genre-bending tendencies of the past haven’t just been upheld, they have been perfected, Devouring Radiant Light offering up a seamless mix of furious black metal, rampaging thrash and even the transcendental pomp of prog. It is the fruit of a happier, healthier band; a record of immense ambition. With their sights set on a permanent drummer (one-time Job For A Cowboy sticksman Jon Rice is currently behind the kit – “We’re definitely thinking of putting a ring on it!” Scott jokes), plus US support slots with System Of A Down and a UK tour on the horizon, 2018 looks set to be a good year.